Border Patrol finds bodies in the brush. 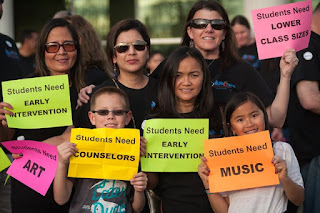 The problem of the SCUSD budget crisis is not a problem of teacher health benefits. Rather It is the failure of California School Finance. Present funding, including LCFF is substantially unfair, inadequate, and unequal. The report, “The Adequacy and Fairness of State School Finance Systems,’ from Rutgers University shows that California ranks 41stout the 50 states in state fiscal effort, and 47thin adequacy of funding. These shortages produce the strikes in Los Angeles, Oakland, Sacramento and more to come. Teachers are insisting that their districts provide at least adequate funding for the students. This inadequacy is seen more clearly in out of control class sizes. You would think that California, the richest state in the nation, could at least get to average. We need a new tax structure – like the Schools and Communities First proposal, to fix the budget problems and properly educate our children. WASHINGTON – Most states’ education finance systems do not target resources at districts that serve high-poverty students, and funding systems in virtually all states fail to provide adequate support to all but the most affluent districts, according to a new report released today by researchers at the Albert Shanker Institute and Rutgers Graduate School of Education. Over the past decade or so, a political consensus, backed by high-quality empirical research, has started to emerge about the importance of adequate and equitable funding for U.S. public schools. While there is plenty of important debate about how money should be spent, virtually all of the best policy options require investment. The idea that “money doesn’t matter” in school funding is no longer defensible. Effort: How much do states spend as a proportion of their total economic capacity? Adequacy: Do states spend enough to meet common outcome goals? Progressivity: Do states target more resources at the districts with the most need? These three measures are calculated using data from roughly a dozen sources, and control for various factors – such as Census poverty, labor market costs, population density, and district size – that affect the value of the education dollar. The data presented in the report apply to the 2015-16 school year. The authors find, predictably, that states vary widely on all three measures. There are states, such as Wyoming, New Jersey, and Massachusetts, in which education funding is relatively adequate and distributed progressively. In most states, however, the results are disappointing and, in some cases, deeply troubling. On average, states devote about 3.5 percent of their gross state products to K-12 education. These effort levels vary between roughly 2.5 percent in Hawaii and Arizona to over 5 percent in Wyoming and Vermont. Virtually all states spend far less than what the authors estimate would be required for students in their higher-poverty districts to achieve national average test scores, which the report uses as a common “benchmark” to assess states’ funding levels. Although our estimates are state-by-state, a rough calculation of U.S. average adequacy indicates that actual spending on the 20 percent of districts with the highest poverty levels in the typical state is approximately 67 percent of estimated adequate levels. In other words, the typical state would have to increase spending by 50 percent to reach the adequate level. 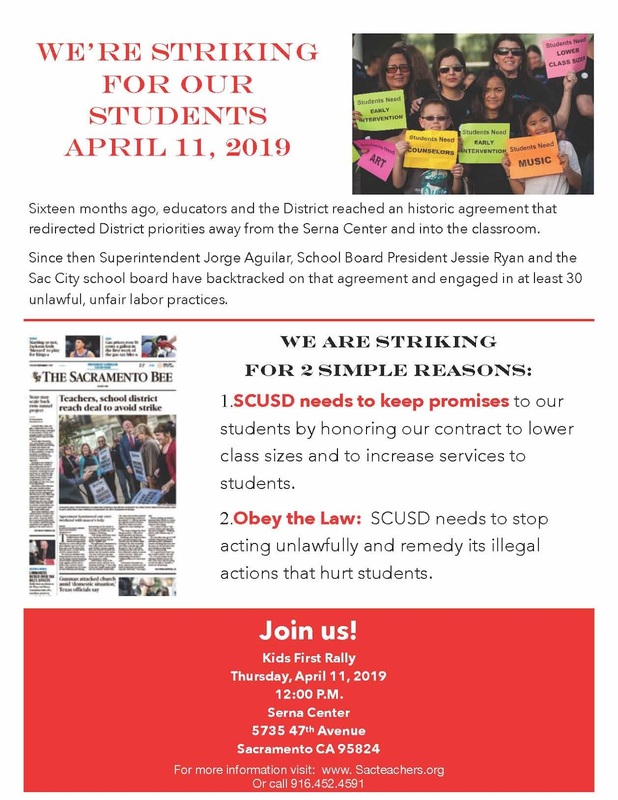 One day after a teachers strike alleging unfair labor practices by the Sacramento City Unified School District, and the district’s call for a “cease-fire,” the teachers union sent a letter chiding the district but suggesting they meet at the end of the month. “A new direction begins with the district reaffirming its obligation to abide by our contract and to remedy the unlawful, unfair labor practices, including the unlawful layoffs of both certificated and classified staff,” read SCTA’s letter to Superintendent Jorge Aguilar. The union proposed two dates – April 23 or April 24 – to meet with the district and their appointed state mediator, Joseph Rios. District officials said they would review the letter and respond accordingly.